I’m an astronomer and I’ve been studying Pluto as a pinpoint of light for over 25 years. It will be so exciting to see this little white dot turn into a geologic world in a matter of weeks. 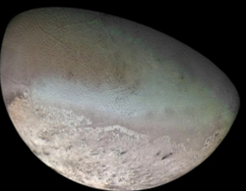 (Right) A Voyager 2 image of Triton, the large moon of Neptune, which may be similar to Pluto in many ways. A polar cap is disappearing, causing the dark ice volcanoes and plumes. What can we learn by looking at tiny Pluto through a telescope? It turns out quite a bit. We’ve already identified and mapped some of the ices on its surface: nitrogen, methane, and carbon monoxide. We’ve also learned that like Earth, Pluto should exhibit seasons, with growing and receding polar caps. And we have blurry maps of Pluto from telescopes, including some from the Hubble Space Telescope, show that frost patterns are changing on Pluto. Pluto also seems to be getting brighter and redder, which would happen if fresh, white-colored frost were uncovering a subsurface of older, reddish methane. Looking at how stars dim as they pass behind Pluto, astronomers have seen its atmosphere double in the past two decades. We hope to see some of this exciting activity as we cruise past Pluto. Our search for Pluto’s secrets will not end in 2015. We will press on to learn more and more, and to answer the new questions uncovered by New Horizons. 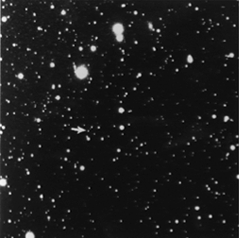 A flyby cannot give a picture of Pluto through time. So using ground-based techniques in the years after the flyby, we will be looking for continuing volatile transport, and monitoring the presence of the various ices on the surface of Pluto. We will also observe for a very special opportunity: in 2018, Pluto will become perfectly fully illuminated to an observer on Earth. We all know how our own Moon becomes very bright when it’s full. This “opposition effect” implies that the Moon has a very fluffy texture, and we’ll be looking closely to see if Pluto brightens like the Moon does. Bonnie Buratti, of the Jet Propulsion Lab/California Institute of Technology, is the New Horizons team expert in “photometry,” which is the measurement of reflected radiation from a planetary surface. Buratti has been fascinated by Pluto for as long as she can remember and is excited to be on the team of scientists who will be the first to glimpse this distant world.